Lingonberries, which we have had in various forms in Scandinavia, where they are immensely popular, are a most flavorsome berry (think of them as a superior sort of cranberry), and are an excellent, too-little-known crop for this region, being native to climates very much like ours (in fact, Washington and Oregon now lead the world in lingonberry production). Lingonberries are known by many other names: cowberries, red whortleberries, fox berries, mountain cranberries, mountain bilberries, partridgeberries, tyttebær (Norwegian & Danish), rauðber (Icelandic), puolukka (Finnish), and lingon (in Swedish). Lingonberries can be eaten fresh, though they are quite tart (they actually have a lot of sugar, more than blueberries, and can be preserved in just their own juice, but they also have a lot of acid); but they are especially good in various cooked forms. They used to be an important staple in the northern-tier states and in Canada, but have become less known in modern times: that is a defect that needs curing, as they are wonderful berries and fairly easy to grow. Especially famous is lingonberry jam (rårörda lingon), which can be made easily with no cooking: just stir the raw berries with a small amount of sugar. Lingonberries typically fruit twice a year, though some varieties can have three fruitings. The first, in spring, is usually very small and essentially useless; the second is the true yield flush, though at least one variety (Ida) is said to have a third, late-fall flush that is also productive. Though lingonberries are nominally self-pollinating, it is consensus that they are much more productive when cross-pollinated; we thus want at least two different cultivars planted. Certain types, as noted below, are regarded as especially useful for pollination purposes. Balsgard, berries larger than any other, said to be of excellent taste; vigorous, but slow-growing and thus late-season (but reportedly good) yielding. 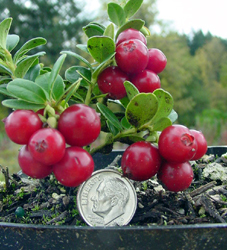 Dwarf, mainly for ornament, as it does not produce a great many berries (grows only 4″-6″ high); still, the berries it does produce are numerous for its size. Erntedank, heavy yields of small- or medium-sized berries; described as “mild-flavored”. Ida, high-yielding; blooms very vigorously after first 2 years (unlike most types, may produce two or even three useful croppings); dark-red berries very large; become over-ripe by mid-November (pronounced ee'-da). Koralle, moderate to high-yielding but slow spreading; light-red berries medium to large; “tangy” flavor; makes up almost all European production. Linnea, Berries are smaller than other cultivars, but a heavy cropper with good yields. Bears in late September or early October. Mostly tart with a slight sweetness. Magenta, early with high yields of large fruit, similar to Erntesegen. Red Pearl, low-yielding but heavily planted due to suitability as a pollinizer; bright-red small to medium berries; spreads rapidly if not containerized. Red Sunset, berry size larger than most lingonberry varieties; fruit said to bed sweeter than most; considered one of the most vigorous cultivars. Regal, low-yielding plant, used mainly as an ornamental; moderate vigor, some frost resistance; dull-red small berries; precocious; one of the oldest types used in the United States. Scarlet, moderate-yielding but vigorous; best used as a pollinator. Sussi, chiefly used as a pollinizer; vigorous; moderate yielding, uniform ripening; small to medium berries; a nice ornamental, with some resistance to Phytophthora root rot. After extensive examination of the literature, we believe that the best bets are Ida for the main crop, with Red Pearl for the pollinator. Ida is quite productive and is reported to have a strong, good-quality taste, while Red Pearl, even though wanted chiefly as a pollinator, can itself set a useful berry crop. pH: lingonberries are even more acid-loving than blueberries, and a good planting mix is 10% perlite, 10% peat moss, and 80% pine bark, with the traditional small handful of soil sulfur. container size: a five-gallon (12-inch) pot suffices for a mature lingonberry plant (mulch to 3 to 4 inches; sawdust works well). watering: don’t over-water; better a bit dry than a bit wet. fertilizer: don’t over-fertilize—use a light hand. sunlight: though most sources say the more the better, one university project found partial shade to work well; if you have short but hot summers, that seems worth trying. As with blueberries, and for much the same reasons, lingonberries are best grown in containers. They are even smaller than blueberries (except perhaps some low-bush blueberries) and can be grown in fairly small containers, from 10 to 12 inches in size. As their Scandinavian popularity would suggest, lingonberries are very cold-hardy (usually listed to Zone 3, though there may be minor variations by cultivar). They are evergreens, and stay in leaf through the winter. In the right soil, they spread slowly but inexorably through underground rhizome growth, but adapt well to container growing. It is not a good idea to interplant them with blueberry bushes, despite the similar soil requirements, because blueberries have extensive but shallow root systems, with which lingonberry rhizomes can get badly tangled. Lingonberries are self-pollinating, but having multiple types around for cross-pollination will produce larger and earlier-ripening fruits (and it helps to have bumblebees around). Lingonberries typically bloom twice, once in early spring and once in summer; the first blooms are usually too early to avoid frost damage (the plants are terrifically hardy, but the blooms are only hardy to about 30° F.), but the second crop is normally plentiful. Plants will probably bear right away, but need two to three years to reach best productivity. It pays, for several reasons, to buy them as plants, even though they can be grown from seed; as always with fruits and berries, buy from a reputable specialist house, preferably one in your climate or close to it. Besides acidity, lingonberries like a free-draining soil, preferably a peaty one or a light loamy soil with added leaf-mould, or even sawdust. They can stand a fair bit of shade, but yield best in full sun. Lingonberries are light feeders so don’t over-fertilize: one source remarks, in a note to commercial growers, that “Lingonberries are quite sensitive to over-fertilization.” Pay more attention to maintaining the soil pH good and acid. It is also advisable to mulch lingonberries, ideally with peat moss, adding more from time to time as the plants grow. Lingonberries are often described as quite tart till dead ripe, then with excellent flavor. Harvest accordingly. Lure of the Lingonberry - growing them in Canada. Biology & Culture Of The Lingonberry - good, useful overview of the species. Often also called cowberries, partridgeberries, or mountain cranberries, lingonberries are small evergreen shrubs in the flowering plant family Ericaceae. Their native habitat is the circumboreal forests of northern Eurasia and North America, from temperate into subarctic climates. Lingonberries are related to cranberries, but are by no means the same thing; nonetheless, the many names used for each cause some confusion, and not a few people think they are identical. Lingonberries were long harvested in the wild by all the peoples of northern latitudes in both the Old World and the New World, and were considered an important staple. It is only in relatively modern times that cultivation, and cultivar selection, has taken place. In Sweden and Norway, reindeer steak is traditionally served with gravy and lingonberry sauce. Urf. It was last modified on Monday, 11 February 2019, at 01:39 EST.